It’s just one of those mornings when I have to get up at 4:30 AM and start cranking out breakfast. I know it’s an insane time for most of you to get up that early but if you have a demanding mother who requests you to bake this as the last home baked breakfast for your younger brother before he goes back to college, you have to do it. Trust me. Living with a mom who can start World War III for the smallest things isn’t worth the fight. Are you worth my sleep time? So, I started prepping my usual go-to bread, my variation of Rose Levy Beranbaum’s cinnamon raisin loaf, the night before. 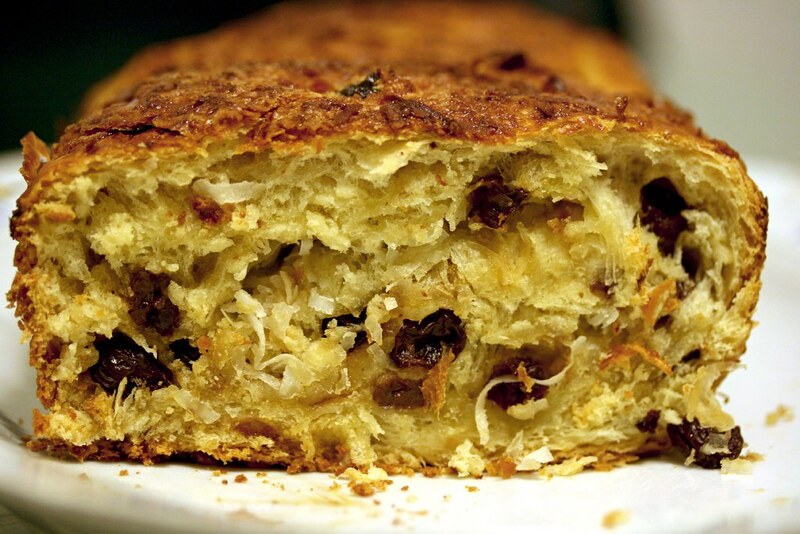 (What I’ve altered from her recipe was replacing the cinnamon spiral with sweetened, flaked coconut, soaked the raisins, and made the dough a bit sweeter). I shaped it, proofed it, and placed the loaves in the refrigerator overnight. Thankfully, my mom’s willing to take out the loaves from the fridge around 3 AM since she’s usually having her early morning food cravings. I popped these babies in the oven around 5. When the loaves are about three-fourths baked through, the entire house smells like toasted coconut. Besides the fact that it made me hungry, it woke up my sleepy-headed father who wouldn’t normally wake up until 7:30. At least my efforts weren’t wasted: my mom’s happy about this loaf since she likes soft bread; my dad’s happy just to eat fresh baked bread and my brother liked it because it’s tasty. I’m just happy because everyone’s happy with the food (I also baked a batch of cranberry orange muffins), have my morning cup of coffee, and GO TO SLEEP. The bread recipe is right after the jump. 1. Make the sponge. In a mixer bowl or other large bowl, combine the flour, water, honey, and instant yeast. Whisk until very smooth to incorporate air, about 2 minutes. The sponge will be the consistency of a thick batter. Scrape down the sides of the bowl and cover it with plastic wrap. Add the butter to the bowl and mix on low speed with the dough hook for 1 minute or until the flour is moistened enough to form a rough dough. Scrape down any bits of dough. Cover the top of the bowl with plastic and allow the dough to rest for 20 minutes. Sprinkle on the salt and knead the dough on medium speed for 7 to 10 minutes. It will not come away from the bowl until toward the last minute or so of kneading; it will be smooth and shiny and stick to your fingers. With an oiled spatula, scrape down any dough clinging to the sides of the bowl. If the dough is not stiff, knead in a little flour. If it is not at all sticky, spray it with a little water and knead it in. Cover the bowl with plastic wrap and allow the dough to relax for 10 minutes. Add the raisins and mix on low speed for about 2 minutes to incorporate them evenly. But don’t worry too much about how they will distribute, because deflating and folding the dough after the first rise will distribute them more evenly. Knead the dough for another 5 minutes or until it is very smooth and elastic. It should be still sticky enough to cling slightly to your fingers. If the dough is still very sticky, however, add some of the remaining reserved flour, or a little extra. Cover the bowl with plastic wrap and allow the dough to relax for 10 minutes. 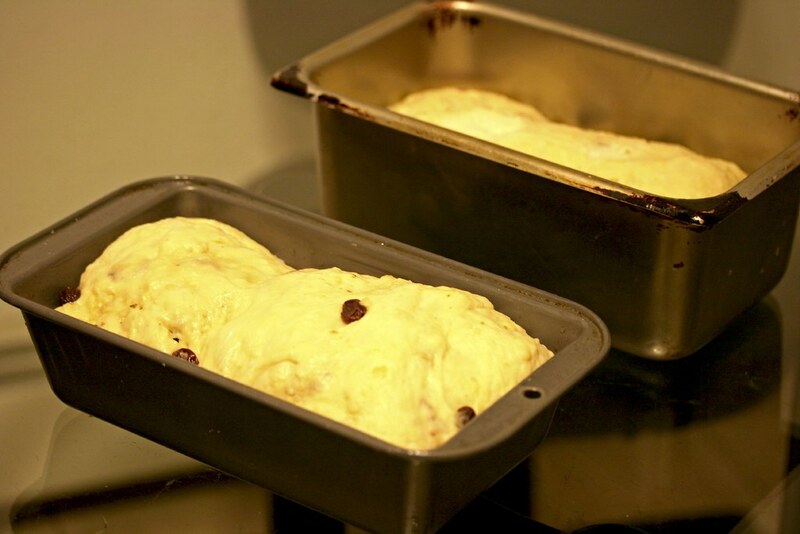 Add the raisins and, with an oiled wooden spoon or your hand, mix in the raisins to incorporate them evenly. But don’t worry too much about how well they distribute, because deflating and folding the dough after the first rise will distribute them more evenly. 5. Let the dough rise. Using an oiled spatula or dough scraper, scrape the dough into a 4-quart dough-rising container or bowl, lightly oiled with cooking spray or oil. Push down the dough and lightly spray or oil the surface. Cover the container with a lid or plastic wrap. With a piece of tape, mark the side of the container at approximately where double the height of the dough would be. Allow the dough to rise (ideally at 75 to 80 degrees F) until doubled, 1 1/2 to 2 hours. 6. Make the optional coconut spiral filling. In a small bowl, mix both coconuts together. 7. Shape the dough and let it rise. Turn the dough out onto a lightly floured counter and cut it in half. Keep one piece of dough covered while you work with the other piece. 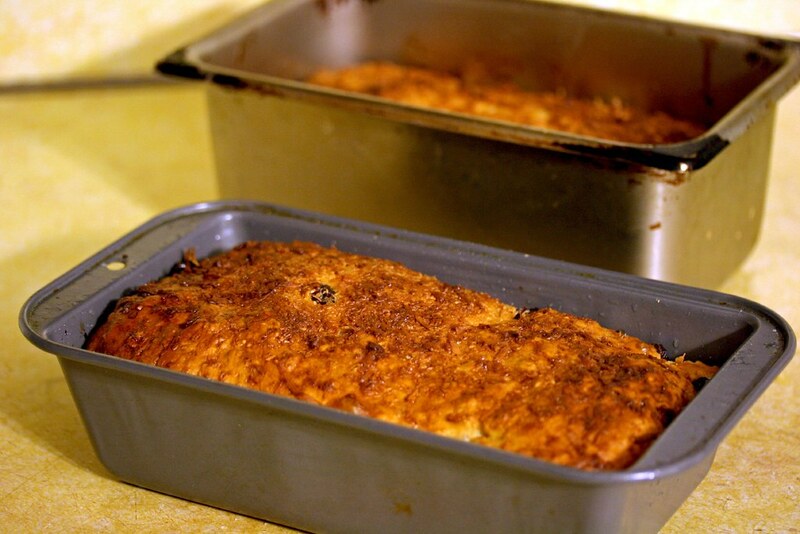 To make raisin bread without the coconut spiral: Shape each piece into a loaf and place the dough in the prepared loaf pans; it will be about 1/2 inch from the top of the pans. To make a spiral bread: You may want to refrigerate half the dough so that you don’t have to rush the shaping of the first piece. On a lightly floured counter, roll out one piece of dough to a rectangle 7 1/2 inches wide by 14 inches long and about 1/4 inch thick. Using your fingertips, gently dimple the dough all over to deflate air bubbles that result in gaps in the spiral. Brush the dough with the lightly beaten egg leaven a 3/4-inch margin all around. Sprinkle half the coconut mixture evenly over the dough, leaving a 3/4-inch margin on all sides. Starting from the short end closest to you, roll the dough up tightly, as you would a jelly roll; brush the top of the dough with egg and squeeze the dough gently all along the length of the roll with each roll so that it will adhere well to the filling. If necessary, use your hands to push in the ends of the roll so that it does not get larger than 7 1/2 inches long. When you come to the end, make a seam by tightly pinching the edge of the dough to seal the filling. Push in any inner coils of dough on the sides that may have worked their way out and pinch the ends of the dough tightly together to seal. Tuck them under so that the loaf will fit into the pan. Place the roll seam side down in a prepared pan; it will be about 1/2 inch form the top of the pan. Repeat for the second loaf. Cover the pans with a large container, or cover loosely with oiled plastic wrap. Allow to rise about 1 to 2 hours or until the center is 1 1/2 inches above the sides of the pan. When the dough is pressed lightly with your fingertip, the indentation will remain. 8. Preheat the oven. Preheat the oven to 350 degrees F 45 minutes before baking. Have an oven shelf at the lowest level and place a baking stone or baking sheet on it before preheating. 9. Bake the bread. Quickly but gently set the pans on the hot baking stone or hot baking sheet, and immediately shut the door. Bake for 50 minutes or until the bread is medium golden brown and a skewer inserted in the middle comes out clean (an instant-read thermometer inserted into the center will read about 211 degrees F.) Halfway through baking, turn the pans around for even baking. 10. Glaze and cool the bread. Remove the pans from the oven and set them on a wire rack. Unmold and cool top side up on a wire rack until barely warm, about 1 hour. It looks so tasty! I hope your brother knows how lucky he is! Anything to keep the peace! The bread sounds wonderful, I know I’d love to be woken up by the smell of it baking. Helen: It was! My brother acknowledges the food but I dunno in reference to your comment though. lol … that last line (before recipe starts) is priceless! Some days are like that: get up, do stuff and go back to sleep. that bread looks very yummy! i love everything coconut so i may try this someday, thanks for the recipe! Aya: Oh, thanks! :) I’m feeling like that a lot ever since I graduated college. Eliza: Thank you! Coconut is AWESOME. After all the proofing of the yeast, the dough doesn’t seem to have risen much. Does it usually have more of a rise or, is it supposed to be a moderately risen bread? Also, on the Jacques Torres chocolate banana dacquoise. Nice photo. Have you sampled it? If you have, is that a layer of chocolate-banana ganache? Hoping you will respond as soon as you can as I will be attempting to duplicating that one immediately. Ugh, sorry about the spelling…that would be uh….duplicate. Cheryl: It should be risen a tad more since it the top layered “shelled” a bit (in other words the top layered is a bit loose). If I kept continuing on the recipe about the notes Ms. Beranbaum wrote, she said that if it did “shell” it’s under-risen. Thanks in regards to the dacquoise photo. I have sampled it. It’s just plain dark chocolate ganache with banana flavored cake. it’s so wonderful but why do we make sponge and flour mixture seperate?